Since 1989, Patio Place has been Laguna Niguel's best choice for incredible discounts on brand name patio furniture, barbecue grills, awnings, umbrellas, fire pits, bar stools, gas logs, and more. We have long-established relationships with the industry's leading manufacturers--NorthCape, Alu-Mont, Firemagic, Galtech, Gensun, Hanamint, Patio Renaissance, and others--and can negotiate the best deals on off-season and closeout buys from prior years. With our high-quality selection, competitive pricing, and value-added services, Patio Place is the best value for patio furniture and more in Orange County. In addition to helpful sales, we also offer expert advice, same-day delivery, repair, cleaning, and custom design and manufacturing services. These services include replacing common BBQ parts, repairing patio umbrellas, refinishing patio furniture frames, and custom-fabricating replacement slings and replacement outdoor cushions. With our cost-effective and comprehensive services, Laguna Niguel customers can make us their one-stop shop for all of their outdoor furnishing needs. Patio Place is available seven days a week, and we welcome your calls or visits. We are located at 845 Baker St., between Bristol and Bear, in Costa Mesa. As a family owned company, we pride ourselves on delivering unsurpassed customer service for everything we do. With our decades of experience and extensive industry knowledge, we can provide expert recommendations and help you to furnish your Laguna Niguel outdoor space, no matter its size or decor. From small backyards to expansive pool areas, we have solutions to fit most tastes and budgets, and will always put your interests first. And, for large, commercial purchases, we will bring samples directly to your Laguna Niguel business and assist you in making informed choices for your decor, budget, usage, and other needs. We offer Laguna Niguel the finest selection of patio furniture from the names you trust most, including Hanamint, Genson, Telescope, and Sunset West. 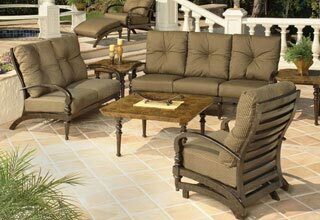 Stylish, comfortable, long-lasting, and affordably priced, our patio furniture is available at a great value. We sell and deliver outdoor benches, bistro tables, chaise lounges, console tables, dining tables, end tables, patio dining sets, patio lounge sets, loveseats, ottomans, sectionals, swings, and more. From this year's patio furniture lines to the previous season's closeouts, our showroom is fully stocked with gorgeous extruded aluminum, cast aluminum, and wicker patio furniture that would be ideal for any Laguna Niguel home or business. Call or visit us today. When you come to Patio Place, you'll find that our fire pits, fire pits with tables, and bar stools come from many of the industry's best-reviewed brands. Available to those in Laguna Niguel for some of the best prices in all of Orange County, our fire pits and bar stools are not only attractive but also well-made and highly durable. They come in countless heights, sizes, shapes, and styles. We also sell a wide selection of bar stools which can feature back rests, cushions, decorative designs, foot rests, swivel components, and more. Visit today and view our impressive selection of fire pits, fire pits with tables, and bar stools for Laguna Niguel. With low pricing, expert advice, and a huge selection of brand name barbecues, gas logs, grills, and more, we can meet all your outdoor living needs in Laguna Niguel for a great value. We sell and deliver quality barbecues and grills, in varying sizes, as well as common BBQ replacement parts, such as access doors, range hoods, lights, warmers, and more. For outdoor cooking enthusiasts in Laguna Niguel, we sell kegerators, sinks, faucets, fridges, and other equipment. 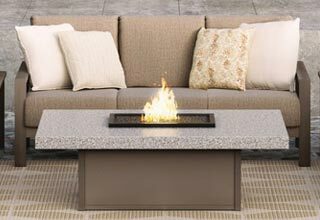 And, for new or existing fire pits and fireplaces, we sell competitively priced, ceramic gas logs in both vented and vent-free models that are stylish, safe, and durable. Call today and ask about our gas line hook-up and parts replacement services for your gas logs and barbecues islands in Laguna Niguel. Laguna Niguel customers can count on us for the best deals on brand name umbrellas, including auto tilt umbrellas, cantilever umbrellas, easy track umbrellas, push to tilt umbrellas, side post umbrellas, and lighted umbrellas. 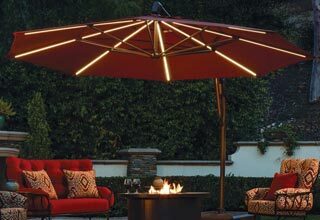 Our patio umbrellas come in a range of sizes and can be enhanced with our stylish umbrella bases, which weigh between 50 and 80 pounds, and our attractive umbrella lights, which are available in LED solar and plug-in models. We can even customize your umbrella to feature your company's name or logo. Learn more today. 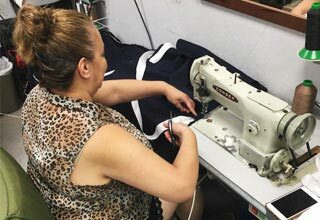 In business since 1989, we've helped thousands of Laguna Niguel customers restore their worn, damaged and faded patio umbrellas, patio furniture, pillows, and cushions. For patio umbrellas, we specialize in replacing broken ribs, recovering torn or discolored umbrella covers, and replacing broken umbrella strings. For outdoor furniture frames, we can restore their original appeal using a protective refinishing treatment. And, for damaged patio chair slings, outdoor pillows, and outdoor cushions, we custom-fabricate replacements using quality outdoor fabrics from Phifer, Sunbrella, and others, which are warrantied for years against damage and available in more than 600 options. From restoring your patio chair's original look, to custom-making replacement cushions to your exact specifications, we have options for every style and budget. We can also stitch in padding for replacement slings, or sew in zippers to make your replacement outdoor cushions easier to clean. Call us today to learn more about Patio Place's cost-effective repairs for umbrellas, patio furniture frames, and more.